Truth #1: It easier to sell 10 copies each of 10 books than 100 copies of a single book. Truth #2: The book world is now one of abundance, not scarcity. Neither of those ideas belong to me. They were first floated by Kathryn Rusch and her husband Dean Wesley Smith, both writers with a lot of great stuff to say about the indie revolution. Indies: Publish Fast Or Die? It’s like they started out with a herd of turtles, not just one. Indie authors are viscerally connected to book sales – you can track your rankings and sales by the hour, and those numbers mean something. It’s income going directly into your bank account. It’s paying back your investment or funding your next book or providing actual income. 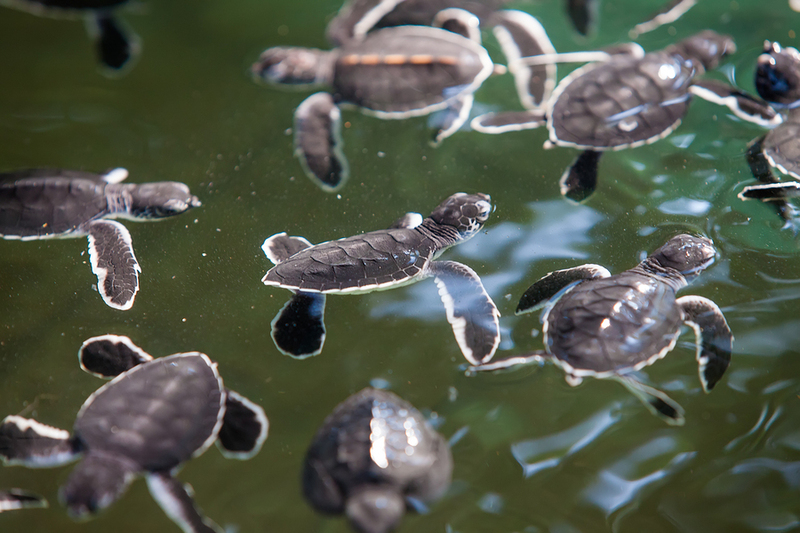 There are huge, tidal-sized forces that drive indie authors to put out books quickly and promote them heavily (even when you understand that it’s not the speed of publishing but the mere fact of having a herd of turtles). In 2012, Rachelle Gardner noted the typical advance for a first-time traditionally published author is $5,000-$15,000 per book, and most of those first-time authors do not sell through their advance, so that is all the money they will ever get from that book. Compared to indie publishing, I know many authors who earn more than $5k per book, often well before the first 12 months after publication. Not everyone, but the ones who are 80% up the mountain have a better chance at it (see Making the Leap). But more importantly, indie authors have forever to make that money, whereas trad-pub authors have a few months to Launch Big or get pulled from the physical shelves. They may remain on the virtual shelves (which is good, because they need to sell somehow), but if they don’t sell well enough, they could go out of print. I know of authors who got contracts in 2010, published in 2011, and are out of print in 2013. It happens. But here’s the thing: concentrating on what a book earns in the first 12 months is scarcity thinking, a left-over from limited-time-on-shelf. Because if a book didn’t hit in the first 3 or 6 or 12 months, it wasn’t going to pay back its investment … because it would become literally unavailable on the shelf. Books used to go out of print. They still do go out of print (see above). But now, there is no reason for that to happen. And with indie authors, it doesn’t. I picked random numbers for this, so you can scale it up or down – thousands of sales instead of hundreds, or whatever. And this stops the race after 5 years, not FOREVER, as noted above. 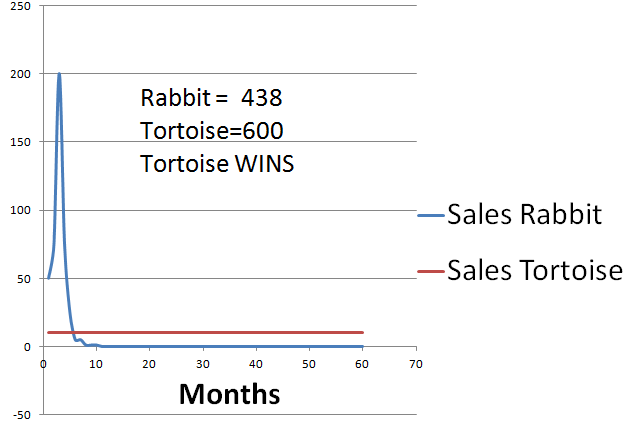 The point being, of course, that slow-n-steady wins the race (the tortoise out-earns the rabbit at about 3.5 years). This isn’t just a trad-pub vs. indie-pub comparison; the same lesson applies to two indie authors, where one is focused on scarcity thinking (I must have a hit right away; if not, I’ve failed) and one is focused on abundance thinking (I need to write more, because more books=success). The scarcity thinker is focused on promoting the rabbit. The abundance thinker is going to focus on getting another tortoise out. When you start figuring out how to build a herd of tortoises, rather than promoting your rabbit, you’re starting to think in the abundance reality of today’s publishing. Writing. Writing is the most important thing. The best use of my time is producing more (and better) intellectual property. Marketing need not be neglected entirely in pursuit of this, but it must take second seat to creating content. My work is FOREVER. (If this doesn’t evoke an existential paralysis, I’m not sure what will.) While the temptation is great to pump out a herd of turtles as quickly as possible, those turtles are going to be around to taunt me for a long time. I want them to be the best I can produce at publication time. This provides some temperance to the mania to have an instant backlist. Rankings aren’t everything. Emotionally, high rankings are awesome, fun, and the boost from an ad is sort of like the sugar rush after eating cotton candy at the carnival. Which usually makes me want to throw up. Slow and steady sales not only win the race, they’re good for my psyche. I need to build a herd of turtles. Promotion is still important, and I’m not going completely into my writer’s cave, just because it’s damp there and my friends are outside. I enjoy social media too much. But writing has to take precedence. I need to think longer range with my writing – where I want it to go, what I want it to encompass. I want my turtles to all play nice in the sandbox together, but I also want them to be unique. I want to explore things with my writing. When I look at that imaginary future herd, I’m awed by the fact that I can create whatever I want. This is the true joy of being indie (see You’re Free, Act Like It). I still think in scarcity ways sometimes. And that’s okay. It takes time for the world to change, and for individual ways of thinking to change. And hearts. Those take the longest time of all. Consumers have been trained by abundance thinking to believe they should be able to find any book they want, but they still look to bestseller lists and other scarcity markers to guide some of their purchasing. That’s okay. Our world is in transition. But I still strongly believe the most forward-thinking will be the winners in this new era. Focus on creating your herd of turtles, and you’ll automatically have your eyes on the right prize. p.s. if you’re thinking of creating a herd of turtles by breaking your novel up into novella-sized pieces (i.e. a serial), I actually recommend against that. Partly because a serial is not a chopped up novel (or at least, it won’t sell well that way), and partly because serials in general don’t sell as well as novels (see All About Serials…). There’s no short-cut to creating the herd. You simply have to work hard, create a lot, and be patient. This was very useful to me. I had kind of a glimmer that as an indie author output would be important. Which kind of makes me sad because I don't really work that way. But I have already come up with the idea of publishing my current work-in-progress in novella-sized chunks rather than trying to work it up to long-novel length. A friend of mine who has been published by small presses recently self-published a novella in a series of hers. It was made available both in print and in ebook form and the print form was a nice little book, small, but not too small. Anyway, I'm really learning a lot from this blog. Keep it up! This single post (though I've been an avid reader of this entire series) just removed 80% of the neuroses I've been carrying. You write this just for me, right? 😉 So obvious, so missing from my thinking of just 10 minutes ago. thanks! Awesome. That's the power of a good idea – and why I love passing them along! Write on, my friend!